There’s certainly an element of drawing the short straw when you end up playing into the sun, but it doesn’t have to be the end of the world, especially when you invest in a pair of sports sunglasses. The best women’s sport sunglasses will be wraparound, providing you with plenty of eye protection, even in your peripheral vision. You’ll also preferably want them to be lightweight so you can wear them for extended periods of time, and impact-resistant material is important – just in case the tennis ball happens to go AWOL. For complete protection, go for polarised lenses, although these are often the most expensive. Alternatively, photochromic lenses are great for changing light conditions. The Julbo Breeze Womens Cycling Sunglasses have made the top of our list thanks to their fitted wraparound style and cool on-trend colours. However, if you’re looking for sport sunglasses that you can wear while on the street as well as out on the field, our Oakley Womens Forehand Prizm Daily Polarized Sunglasses are certainly worth a look. Julbo worked alongside dedicated sportswomen to create these sunglasses, so when it comes to ticking all the boxes, these come pretty close. Their wraparound style completely frames the face, with the shape optimised for a woman’s facial structure. They feature photochromic lenses, which change colour depending on the lighting conditions, while their design is both modern and stylish. Although they lack polarisation, they’re perfect for sportswomen on the move. Although more ‘street style’ then our top pick, these sunglasses from Oakley are not short of a trick or two. Within their 1980s style frame is a clever polarised lens which, according to the brand, fine tunes vision for specific sports environments, whether you’re sailing, cycling or playing field sports. The lenses are also polarised, which blocks 99% of reflected glare, making them perfect for wearing on the water. Different lens colours are suitable for different lighting conditions, so to ensure you’re always benefiting from the best possible vision, these high spec sports sunglasses from Oakley are certainly worth the spend. Thanks to the Switchlock Technology, you can quickly and easily change the lens, while Polaric Ellipsoid geometry ensures clear vision across the whole lens. Thanks to the O Matter material, the frame is extremely lightweight and durable, while interchangeable nose pads and clever Unobtainium earsocks ensure they’re extremely comfortable to wear. These sunglasses are perfect for those looking for a pair with a touch of street style. First and foremost, they are sporting sunglasses, with the curved, photochromic lenses, removable side shields and curved temples ensuring they’re both extremely comfortable to wear and provide superior protection when it comes to exercising out in the sun. Their square lens makes them more street friendly than the sporty style options at the top of our list, and they’re less than half the price of the Oakleys, making them a great alternative option. With a pink lens for dull lighting conditions, blue lenses for definition in cloudy conditions and a grey lens for protection in bright conditions, these cheap sport sunglasses have you covered no matter the weather. They feature a strong, lightweight frame, scratch resistant lenses and an ergonomic design for a comfortable fit. With five interchangeable lenses, you’ll be spoilt for choice! Grab these sunglasses while they’re on offer at Amazon. These sport sunglasses go to show that you don’t need to spend an arm and a leg for a decent pair, so long as you can break away from the big brands. If three lenses aren’t quite enough, these sunglasses boast five, with the addition of a yellow lens for night vision and a transparent fresh lens to protect your eyes from small insects when you’re speeding along on a bike. 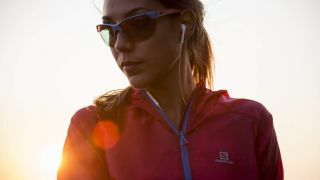 Offering up 100% UV protection plus photochromic lenses to ensure the best vision in various lighting conditions, if you’re looking for a good pair with a mid range price, these women’s sport sunglasses from Endura should do the trick nicely. They feature an adjustable rubber nose piece and soft touch rubber pads on the temples to ensure they’re comfortable to wear for extended periods of time and don’t slip around if you happen to get a bit sweaty. Eyes: sorted. Facial skin? Get it covered with our best face sunscreens.